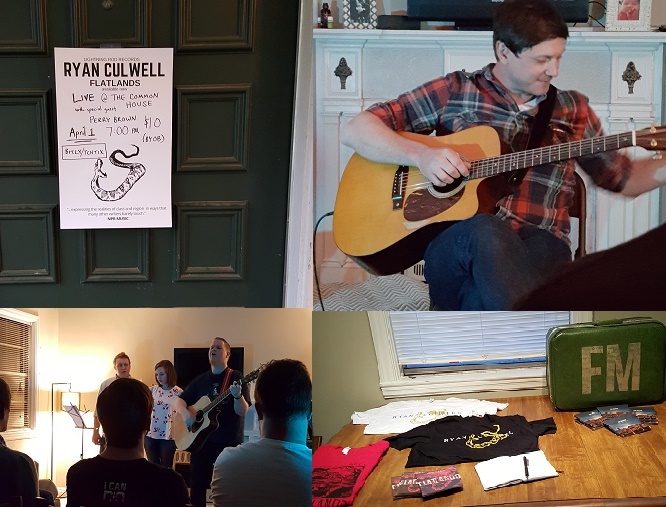 We didn’t know what to expect when we received an invite from Matt Waldrep to a show at The Common House earlier this month, but we decided to check it out. What makes The Common House so interesting is the fact that it’s actually a house, Matt’s living room to be exact. It is probably one of the few true underground music scenes currently operating in Birmingham. It is so underground that the address is sent to you once your ticket is purchased and each show only seats around 20 people. As we walked through the front door, Matt greeted us with a big smile and a lot of excitement. He knew what a great show we were about to experience. By the end of the night we were just as excited as Matt. We also made a few new friends there who share in our love for local Birmingham music and up-and-coming artists. There’s no green room at The Common House, so you are front and center with the artists the entire time. You are able to hang out with the artists before and after their sets, an experience you would not normally have. The welcoming and intimate atmosphere for the artists and audience is what draws you in to this charming house. The night we went, we got to enjoy Perry Brown and Ryan Culwell. They were fantastic! In fact, we have't been able to stop listening to their music online. They were fun, soulful, amusing, and filled the room with powerful music. Each gave some insight into how they craft their music. This was raw, unfiltered, musical craftsmanship at work right before our eyes. At the end of the night, part of us wanted to keep The Common House a secret “Fight Club” style, but the other part of us knew that the experience was too good not to share with everyone. We believe that experiencing The Common House should be on everyone’s Birmingham Bucket List. The next show is Saturday, 4/30 and is only $10! (BYOB) Saturday night will feature Jameson Elder, Hanna Rae, and Codie Gibbons. When you go, be sure to thank Matt for opening up his home to random music lovers and to amazing artists like Raquel Lily, Corey Nolen, Jeremiah Daly, and the list goes on. It may be called The Common House, but what you’ll experience is far from common.